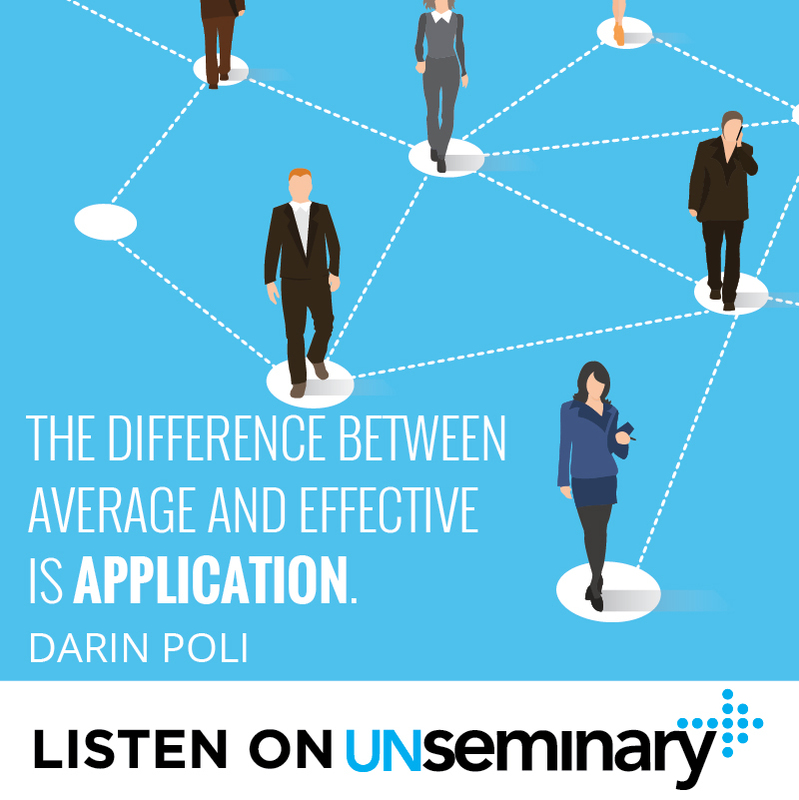 Welcome back to this week’s episode of the unSeminary podcast. I’m excited to have Darin Poli, Executive Pastor of River Valley Church, with me today. River Valley Church is a great church in the Twin Cities metro area of Minnesota and is celebrating their 20th anniversary this year. They have an attractional model of church—they want to attract people to the church and then send them out to invest in their communities and invite others. River Valley started with just 13 people 20 years ago and now has 8 campuses in Minnesota and 2 campuses overseas. 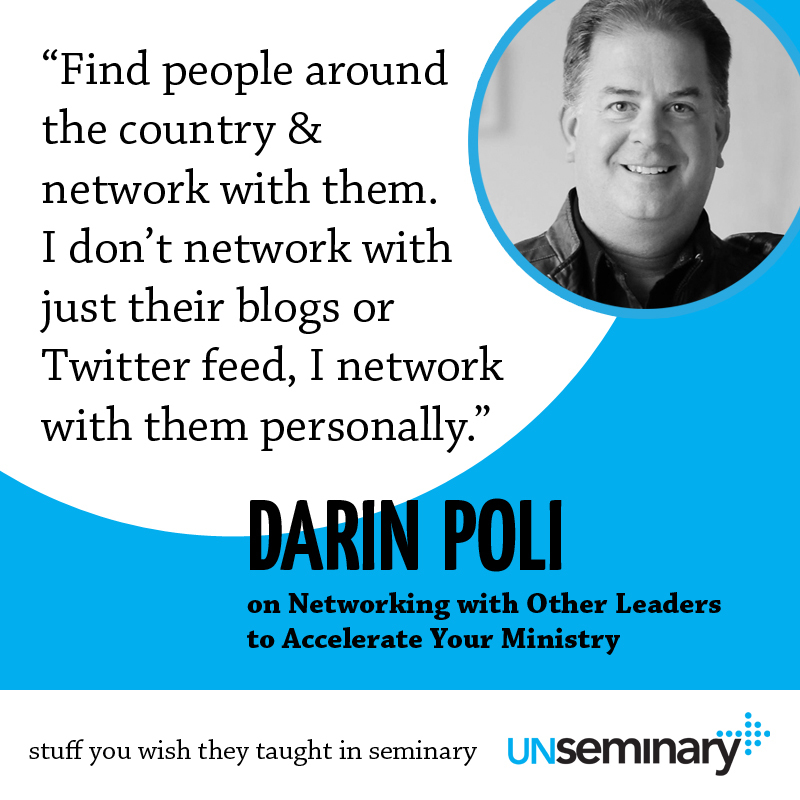 Network connections are vital in developing as a leader and growing your ministry and Darin talks with us today about how best to find and form these connections. Find similar people around the country and network with them. // In order to work with excellence as an executive pastor in a growing church, Darin challenges his own personal growth. He does this by networking with other people in similar positions around the country so as to learn from their experiences and share ideas. This type of networking doesn’t mean just following their blogs or social media, but actually communicating with these individuals, getting to know them and building relationships. These people are what Darin calls peers in position but not peers in influence. What this means is that there may be an executive pastor who has been in a similar position for much longer, or someone who works with more campuses than Darin does. Learning from those connections are a huge part of Darin’s growth in his role and he models that for the staff at River Valley as well. Chase people. // When asked how he finds these people to create strong network connections, Darin’s answer is that he chases them. “I believe you gotta chase people,” he says with a laugh. He doesn’t have his assistant just send an email once to try to make a connection, but Darin tries to get into their world personally. He’ll attend their conferences and speak with them face to face, asking them to have coffee with him. This helps Darin determine if there’s a true relational chemistry between the two of them. Sometimes the timing isn’t right and that’s ok, but if he wants someone in his life, he believes the responsibility is on him to chase them and pursue that connection. Ask a clarity question. // There is a fine line between chasing someone and harassing them, so it’s important to tread that line carefully. Darin does this by making a couple of connections with the person and then asking what he calls the clarity question: “Do you have time for another network connection in your life?” Most people want to know what the other person is expecting from the connections they’ve been making. It’s important to let that other person know that you want someone to share ideas and experiences, but it has to be something you both want. Let the person know if you want to talk on the phone a few times or email. Make it clear that it’s without pressure and you will accept it if they say no or that it isn’t a good time at the moment. You can reach Darin on Twitter @DarinPoli or lean more about River Valley Church at rivervalley.org. 00:39 // Rich introduces Darin Poli and welcomes him to the show. 01:20 // Darin gives us a flavor of River Valley Church. 02:07 // Darin talks about his roles within the church. 03:13 // Darin talks about the building programs. 04:14 // Darin talks about personal growth within the team. 05:51 // Darin talks about building relationships through networking. 08:19 // Darin gives examples of how these relationships work. 09:44 // Rich gives an example of the benefits of relationships gained through networking. 10:57 // Darin shares his principle for 2016 with us. 13:40 // Darin shares his passion for Peer Mentoring. Inspiring Leader // Billy Graham. Craig Groeschel. What does he do for fun // Golf. Skiing. Rich – Well hey everybody, welcome to the unSeminary podcast, my name’s Rich, the host around these parts. Thank you so much for taking time out, listen we know that you’re really busy this week at your church, you’ve got a lot going on and we just thankful that you would take some time, to plug us in your earbuds as we say and just really jump into a conversation. Today I’m privileged to have Darin Poli from River Valley Church. Now this is a great church. I know I keep saying this, but if you’ve never heard of River Valley, you really should. They’re an incredible church, they’re 20 years old. Actually this is your 20th anniversary this year isn’t it? Rich – That’s incredible. So from Minnesota’s Twin Cities, a great church. They started with just 13 people 20 years ago and have grown a little bit larger than that today. So we welcome Darin on the show today. Darin, welcome to the show. Darin – Yeah thanks so much. I’m excited to be here and be part of the podcast and listen in to everything that’s happened around the country too. Rich – That’s great. Darin why don’t you tell us a little bit, give us a flavor of River Valley, what would people expect when they get there and then tell us about your role there at the church. Darin – Yeah River Valley, we’d say we’re an attractional model, so we want to bring people to the church and then send them out. So it’s an attractional, excited, celebratory model and we’re multisite. We’re 8 campuses around the Twin Cities in Minnesota and we’re 2 campuses overseas. So when we track numbers and everything we tend to track our Minnesota campuses. Darin – We resource our campuses around the world, one in Spain and one in Swaziland, Africa and so it’s exciting. We’re around 85 hundred in weekend attendance right now. A little perspective, 5 years ago we were about 25 hundred. Rich – Wow that’s incredible. Darin – So the last 5 years has been a fun ride. We’ve learned a ton and made a lot of mistakes and hopefully are doing some things well and it’s been quite a journey. My journey, as an Executive Pastor is pretty unique for a lot of XPs, Executive Pastors around the country. I was a Youth Pastor for 14 years, then I was a Campus Pastor and an Executive Pastor for 3. Darin – We’re just kind of a unique mix. Rich – Yeah that is interesting. Darin – That was when multisite wasn’t big, it was about 12 years ago. I did Campus Pastor for 3 years, then we planted a church. So my wife and I planted a church, not too far away, then long story short, our Lead Pastor, Rob Ketterling and I merged our 2 churches together and we went multisite. Darin – So in the last 5 and a half years we went from 3 campuses to the 8. So now I’m back being an Executive Pastor again and have the opportunity to speak. I probably do 8 or 9 weekends a year as well. Darin – So that’s a real part of the enjoyment, but team development, raising up our team, finding staff kind of is just a huge thing. Whoever has the best staff wins. Rich – Nice. Now you were saying, just before when we got started, you were saying this weekend is kind of a unique weekend, something the first and last 3 years. Give us a sense of what that is, what was that? Darin – Yeah I was just sharing that. I shared with our team on Tuesday. This week is the first week in 2 and a half years we haven’t been in a building program. Darin – We have built 3 church buildings in the last 2 and a half years. Darin – So not one but 3 and each one has overlapped, which is either insane or God’s [Inaudible 00:03:32] or whatever and some of that is Pastor Rob’s but he’s a strong visionary. Darin – God’s been faithful and we’ve learned from so many people. So we’re taking a little breathing room, but we really, right now, we have room in our campuses for growth of about 4 thousand more, so we feel positioned well. Darin – If it’s another couple of years before we build, I’m all good with that because we can—and Pastor Rob is too—because we can grow and that’s always our desire. Rich – Nice. Now you’ve obviously, to be an Executive Pastor in the role that you’re in, in a growing church in a really expanding time, you obviously must be growing as a leader, what are you doing to kind of grow yourself, grow the people around you? What does that look like for you? Darin – I would say the straightest answer for me is, I find people around the country and I network with them and I don’t just network with just their blogs or their Twitter feed, I network with them personally and I challenge our staff to do the same thing. But I’ve done it, Rob does it and I think it’s a huge part of our growth. I find I’m close with 3 or 4 people that are in, what I would call similar positions, but have greater influence. So for me, and I’d say that’s actually more, it’s about 6 or 7, because I really love networking. Darin – But 6 or 7 Executive Pastors in my life that are peers in position but not peers in influence and they may be 3 campuses behind us or 10 thousand people beyond us or maybe an uncle to me where they’ve been an XP and they’re in their mid-50s and they’ve been in it 20 years where I’ve been an XP for 7 years. Darin – So to be honest, I could say I read, I do podcasts and I do all of that stuff, but those connections are huge and we’ve kind of thrown that through our team as well. We place an expectation on every key staff member to do that. Rich – Now let’s talk about that, let’s talk about how you develop those kinds of relationships. Part of what I love about this is, this has been very similar in my life, reaching out and interacting, actually trying to develop relationships with people in similar ministries is critically important. How do you do that, how have you started some of those relationships? Darin – That’s a great question and my answer is I chase them. I mean it and I believe you’ve got to chase people and I think when you chase people, what I mean is it’s not just my assistant sending one email, I try to get in their world and it might be I’ll try to be at their conference; if I really want them in my life I’ll try to be at their network event and just create a connection say, “Can we have coffee, whatever?” Then usually if I chase them, you find out: is there a God equation there or not, is there a chemistry? You’ve probably found this as well, most of the guys and gals around the country that are doing amazing, they love to network with people too. Darin – So as long as you’re not wasting time, they’ve been all in, but to be honest, I’ve probably chased 8 and got 6. Darin – You know, 2 of them just didn’t seem to connect and whether it’s time or season or life and that’s all good. There’s probably 2 that would say that about me too, that around the country there’s other people maybe that have chased me and I have natural connections, so I tell people the onus is on me if I want somebody to network in my life. Rich – Absolutely. Give us a sense of where that line between chasing someone, which I love that language, versus harassing them, what does that look like for you and how have you tried to balance that out? Darin – Yeah, my kind of line is, I will make a couple of connection and then I will ask them a clarity question. Darin – So I’m also clear of, “Hey I’d love to network by text, 10 or 12 times a year and just talk on the phone,” but usually I find out when I ask that question, they might say, “Ah it’s not a good season, time,” or whatever and I just let them off gracefully and then we’re good. Rich – That’s fine. Can you give us a story or an example of a time where you would say a relationship like this has been critical or been decisive in your leadership, where it’s made a difference, it’s kind of gone beyond just the conference, it’s gone beyond reading someone’s blog or listening to a podcast, where either maybe they’ve helped with something, they’ve helped take something further? Give us an example of that. Darin – I believe the relationship, I’m passionate about this, so shut me down when I go too long here okay? Darin – I believe the relationship goes from introduction to an affinity to a relationship and so those other conference, roundtable stuff, the guys I’m talking about and there could be a lady as well, but right now it’s some XPs that are guys that are in my life. Literally yesterday I was texting 2 of them about some strategic staffing decisions we were making here at River Valley and it one of them was staffing dollars over our ratio to budget and I just said, “Give me your insight, what do you recommend? What were you doing when you were our size?” Because we have the relationship already, we can do it by text because there’s a trust factor there. Darin – I learned we won’t do it with each other if we’d just met each other at a conference, but once they know… so that just happened yesterday because we’re looking at 2016 staff salary allocations and these 2, they responded within 30 minutes and you don’t have to set up an appointment. So that’s where that’s valuable and we just agree together that we trust that relationship. We don’t bother each other with a lot of small stuff. Rich – Yeah that’s very cool. I have a similar relationship with a guy who does a really good job on the group’s side and as an example from my ministry, we have really struggled with groups, like so many attractional churches, that is an area where we just have to continue to pour the gas on, continue to work with and this was years ago, it would be almost 10 years ago I’ve been interacting with him. This person has written a book, he will remain nameless in this conversation, on the group’s thing and we were talking about the whole coaching. Rich – I think that’s a perfect example where things evolve, things change and being in a relationship like this will help you take it to another level. Now how are you encouraging your staff to get involved in this? I’ve struggled with this as well, I’ll tell our staff, “If we’re going to send you to a conference, I want you to come back with relationships. Not just a notebook full of points, the bigger thing is come back with 1 or 2 people that you can actually call, that’s a bigger value.” How are you doing that in your church? Darin – What I love about the relationships you and I are talking about is I call it a peek under the tents, it’s a peek behind the curtain. Rich – That’s very good. Darin – It’s the honest view, not the publicity view what’s going on at the church. Not that the publicity is untrue, but you can judge that for yourself, but it’s that peek behind the tent where you get the real story. So for our staff, I oversee all of our department heads, all of our ministry departments, all of our campus pastors and so in that role they are held accountable to have a minimum of 3 of these relationships in their lives and it’s tied to their performance evaluation. Darin – Yeah I’ll share a principle that’s kind of big in my life this year, I always have different things. This year a principle in my life is I think the difference between average and effective is application. I do, I think if there’s a gap between average and effective it’s in application and application isn’t the most exciting visionary word that people like to use, but I just think we have so much information. Darin – I mean podcasts like this and Stanley stuff I’m listening to and Groeschel’s and all these, there’s so much information and it’s, “Oh I read this book,” and “I did this,” but it stays there in that information phase and I think these relationships, it’s all about application. Darin – Versus let’s do it and no information. So it is serious on our team and I would say some are more excited about it than others, but the ones that are not we’re just trying to move them along because we’ve said we want to be effective, we don’t want to be average and become kingdom souls are at stake, we’re trying to reach people. Rich – Absolutely. I think there’s a part 2 here where the reality of it is, our churches are, across the country, we are wrestling with the same issues, the conversation you just talked about, staff to expense ratio, every church and hundreds of people are listening in now are thinking that question, they’re wondering about that. So rather than just being in your room wondering, “Maybe I can come up with this myself,” let’s use the wisdom of each other to learn from each other for sure. Rich – Anything else you’d love to share on this topic before we jump on with the rest of the episode? Darin – I think the better the relationship you have with a few, and I don’t call them coaches, I call them peer mentors, they’re peers but they’re mentoring and I think when you’re a peer mentor the roles can change too. Sometimes I can mentor you, you can mentor me and it’s really clear. I just think the closer you are, the better information you get, because the closer you are, the higher level of trust and that could be true for youth pastors, campus pastors, kids pastors, executive pastors, it’s true for lead pastors. I see Pastor Rob model this in his own world where he’s chased some really effective pastors around the country and now he’s in their lives and he learns a ton and now there’s other pastors chasing him. So you’re right, we’re super passionate about it.